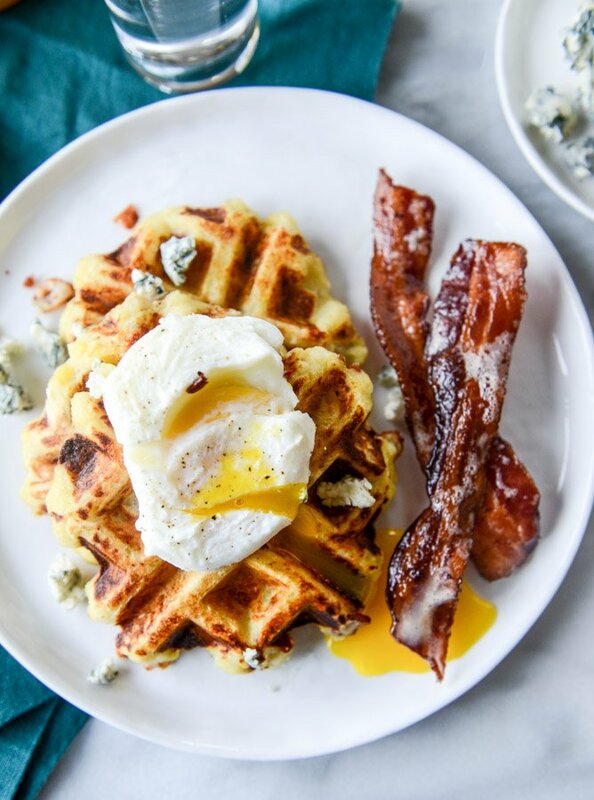 Bacon Blue Cheese Mashed Potato Waffles. Important question: do you have any mashed potatoes left? I know that seems like quite the rare possibility, but… maybe if you do? 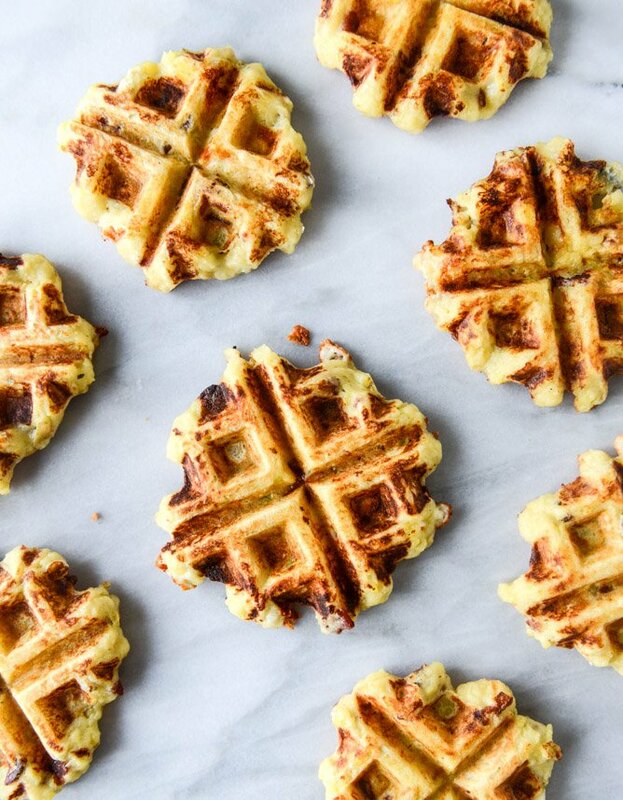 Toss ’em in your waffle maker. Add some bacon, some blue cheese, fry up an egg (because, um, of course), brush that dang waffle maker with bacon grease (yep I said it) and go to town. I should add, that perhaps, this should be done after one more full Thanksgiving plate is consumed. My Thanksgiving leftover ideas almost ALWAYS require an egg. Make a sandwich? Top it with an egg. Making tacos? Add an egg. Breakfast hash? I’ve talked for years about how my mom would make MASHED potato pancakes. We are talking complete comfort food, often served with scrambled eggs. Probably fried in bacon grease. They were ridiculously delicious and tasted like 1994 and I was pretty positive they would work just as well in the waffle maker. Waffles, not pancakes. Are we over pancakes in 2015? Is it about waffling everything? Maybe, in which case I’m going to go get the sweet potatoes too. See ya! Heat the waffle iron to it’s highest setting. 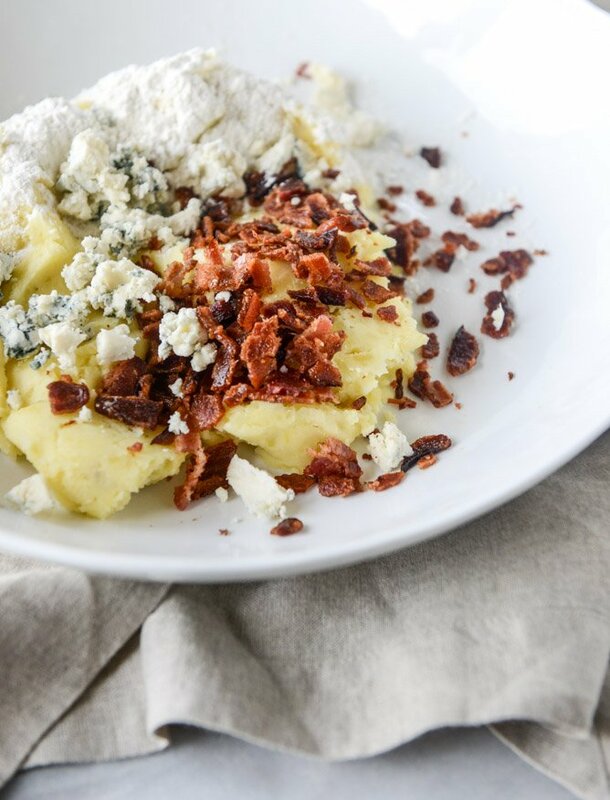 In a large bowl, mix together the potatoes, flour, egg, crumbled bacon and blue cheese. 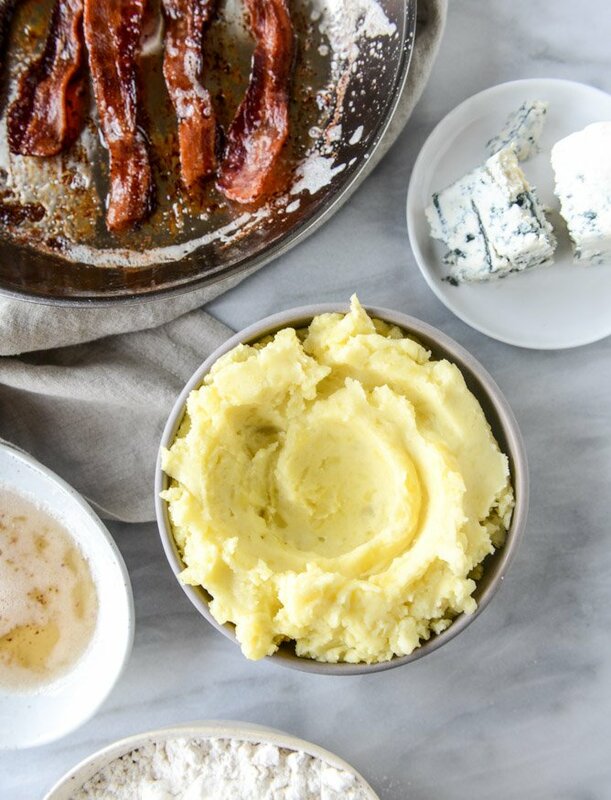 If you want to use salt and pepper, more butter, or flavor, do so at your discretion because it totally depends on how your mashed potatoes were made on thanksgiving! You might also find that you need a touch more flour if your potatoes were super buttery. Ideally, the potato batter will be a soft and sticky dough. Place a scoop right in the center of your very hot waffle maker and close the lid. Cook for a few minutes until crisp on the outside, about 3 to 4 minutes. Repeat with remaining potatoes. Serve with extra bacon, crumbled blue cheese and an egg! Sooo what are your leftover plans today? Soooo what are your leftover plans today? Tell Me What You’re Baking for the Holiday Season! I’ve never been more grateful to own a waffle maker. FINALLY. yes!! i have the tiniest scoop of garlic buttermilk mashed potatoes left. i’m tempted to make a mini waffle while everyone is out of the house so i get it all to myself, lol. These waffles look amazing! What a great use of yesterday’s leftovers! MAN, I need to get a waffle iron ASAP. These look sooooo good. I guess waffles are ‘in’ right now and I’m seriously missing out! Well, it will just be another kitchen appliance on my Christmas list this year! These look so amazing! Can you just send me some, because I’m still too full from yesterday. I can’t make it off my couch to the grocery store. This recipe just combines two of my favourite things – waffles and potatoes <3! Oh my freaking golly. This. Just, THIS. Potatoes are my ultimate comfort food, and this just amps everything up to the next level. 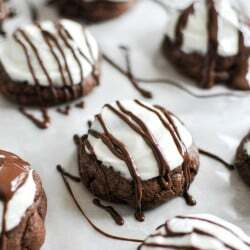 Definitely going to make these for the weekend. Thanks for the inspiration. Loving everything about your post! girlfriend. i need this in my life. MOre than dessert! ;Because I’m a savory person. I want these so bad! Boo for not having a waffle iron, brainstorming alternative ways to get those crisp edges ALLL OVER. These look fabulous. And with blue cheese Ugh. Craaaaave. my mom always made mashed potato pancakes, too! and always after thanksgiving and christmas. YUM. Gorgeous pictures. 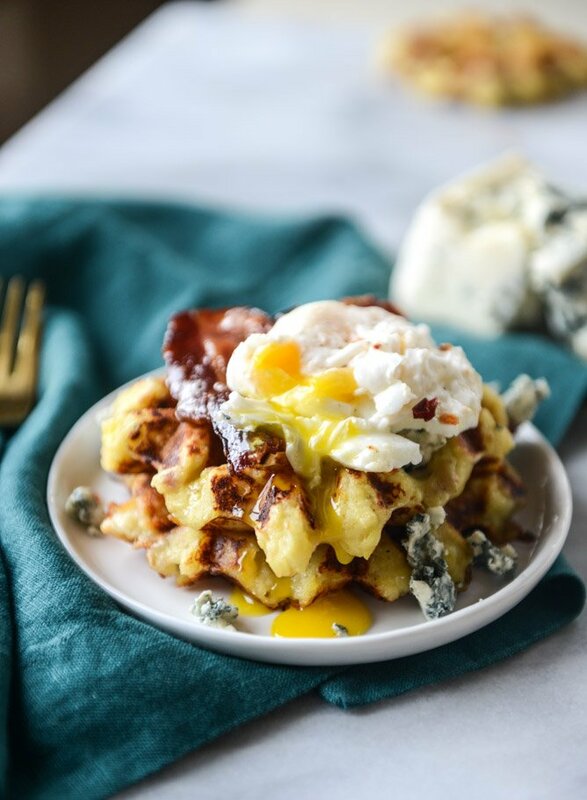 I made these bacon blue cheese mashed potato waffles for the super bowl party and it was a crowd favorite. I’m also gonna pin this post on my Pinterest board my followers will love it. Thanks for sharing, Jessica! 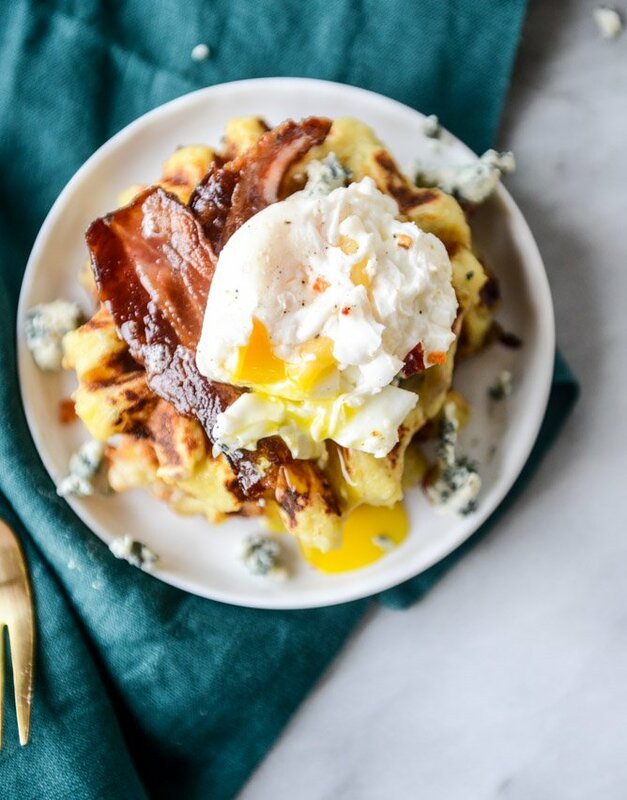 Gorgeous photos and amazing looking bacon blue cheese mashed potato waffles! I am obsessed with waffles! I’ll definitely try it! Thanks a lot for sharing! 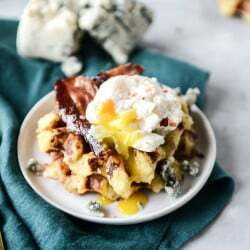 These bacon blue cheese mashed potato waffles look so zesty and tasty! Absolutely love your creative idea! Thanks for sharing!